The R-PLEX Human PlGF Antibody Set includes a matched capture and detection antibody pair and calibrator for the quick and easy measurement of PlGF in biological samples. R-PLEX products leverage MSD’s electrochemiluminescence technology for better sensitivity and a larger dynamic range than traditional ELISAs. R-PLEX matched antibody sets enable the development of singleplex and multiplex immunoassays. Individual assays may be developed using MSD avidin- or streptavidin-coated plates. Custom multiplex assays with any combination of R-PLEX analytes, as well as R-PLEX plus U-PLEX analytes can be developed on U-PLEX MULTI-SPOT plates. To learn more about the advantages of R-PLEX products click here. 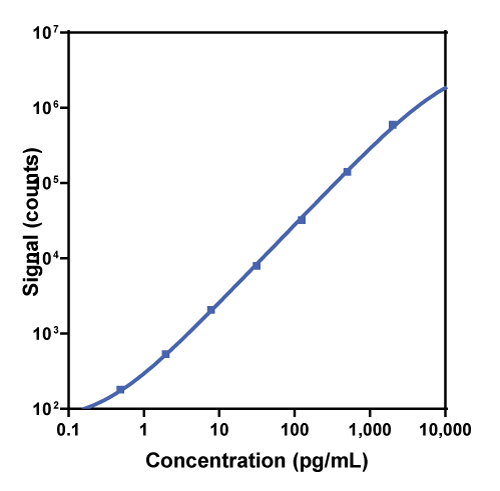 Calibration curve for the R-PLEX Human PlGF Antibody Set was assessed and representative data is presented below. Description - Placenta growth factor (PlGF, PGF, PGFL, PLGF) is a member of the PDGF/VEGF family of growth factors active in angiogenesis, vasculogenesis, and endothelial cell growth. PlGF was first identified in human placenta. PlGF binds and signals through VEFR-1/flt-1 receptor. PlGF plays a role in inflammatory processes by attracting and activating monocytes. The source of PlGF during pregnancy is the placental trophoblast, and is a biomarker for preeclampsia. PlGF is also expressed in the brain and participates in promoting adult pathological angiogenesis. It has been shown that PlGF expression by melanoma cells can be linked to tumor growth. Effects of Sorafenib on Intra-Tumoral Interstitial Fluid Pressure and Circulating Biomarkers in Patients with Refractory Sarcomas (NCI Protocol 6948). Pharmacokinetic and pharmacodynamic analysis of circulating biomarkers of anti-NRP1, a novel anti-angiogenesis agent, in two phase I trials in patients with advanced solid tumors. Phase 1b dose-finding study of motesanib with docetaxel or paclitaxel in patients with metastatic breast cancer.